The White House and Monster.com, the job search website, teamed up yesterday to launch a new initiative to save the job market. According to Monster.com, the goal is to let job seekers have a voice in the debate. Here’s a better idea - how about providing workers who are currently employed with more employment security and a greater chance of keeping their jobs? The U.S. is a dynamic market economy that both creates and destroys millions of jobs every month. Job growth has been anemic over this recovery because nearly as many jobs have been killed each month as have been created. According to numbers released this morning by the Labor Department, 4.2 million people were newly hired in September 2010, while 4.2 million quit, retired, or were let go by their employer. About half of these, between 1.8 and 2.6 million workers each month over the last year, are laid off or discharged by their employers – about 24 million workers a year. Reducing layoffs by just 10 percent a month would mean that over the next year 2.4 million jobs would not be destroyed, 2.4 million workers would not lose their jobs, and employment would increase by 2.4 million people. The government has shown that it is unwilling to do what it takes to create millions of jobs. But it has a real opportunity to adopt a jobs policy that helps workers keep the jobs they have – and at little added cost to government budgets. Work share programs enable employers to temporarily reduce weekly hours of work for employees, rather than laying some of them off. Workers collect unemployment compensation for the lost hours of work to help them make up lost pay. The benefits are clear: the economy stops losing jobs, workers – especially younger workers and more recent hires – avoid unemployment and are able to keep skills current, and families have greater income security. Employers retain skilled and committed workers and avoid the high costs of hiring and training new employees when the economy finally does pick up. Employers can also use downtime due to reduced weekly work hours to provide training for their workers. The impact on government budgets is minimal. The costs are about the same to the Unemployment Insurance system when five workers whose workweek has been reduced by one day each receive UI benefits for that one day as when one worker who has been laid off collects benefits for a full week. A temporary tax credit for businesses that choose work share over layoffs would encourage widespread use of the program and would compensate employers for any increased costs related to maintaining full benefits for employees in the work share program. 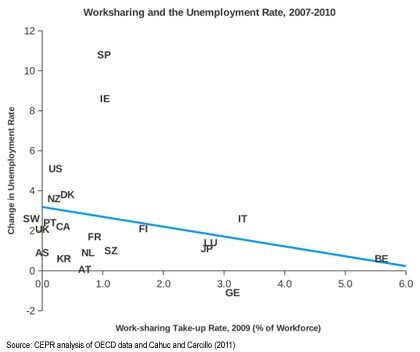 Work share programs have successfully held down the increase in joblessness in a number of European countries. Germany shows how this can happen. According to the IMF, real GDP declined in Germany by 7 percent, compared with about 4 percent in the US. Germany’s unemployment rate decreased slightly during the worst months of the recession and now stands at 6.8%. Unemployment in the US, meanwhile, increased by 5 percentage points to 10%, and currently stands at 9.6%. Germany implemented its current work share (Kurzarbeit) program in 2008, shortly after the onset of the recession and will continue payments to workers and subsidies to employers utilizing the program until March 2012. A bold American version of a work share jobs policy could make a major dent in US unemployment. It’s a jobs policy that Democrats and Republicans should be able to agree on. The need is urgent – it’s time to get serious about helping workers keep their jobs.